Speed, Agility & Quickness (SAQ): designed to strengthen a player’s confidence, coordination, skills and movements both on and off the ball. 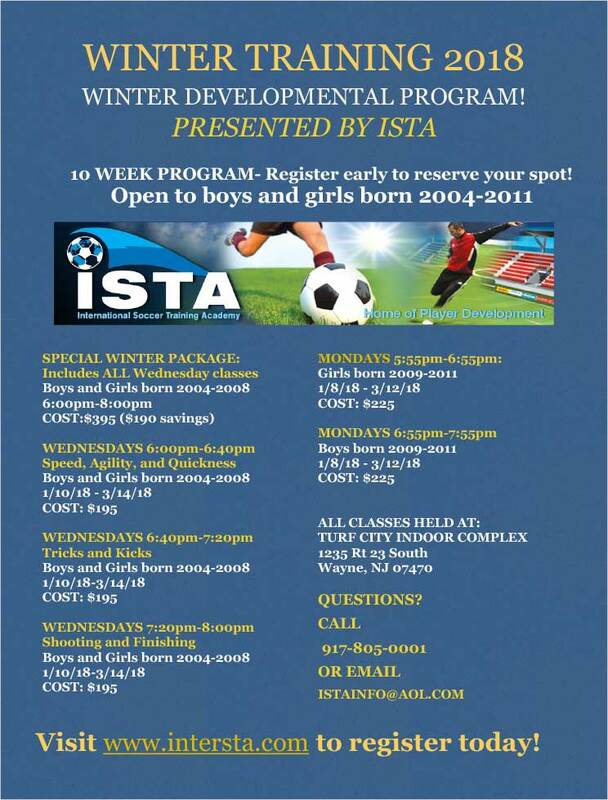 This 40-minute class is held every Wednesday for 10 weeks from 6:00pm-6:40pm at Turf City Indoor Complex in Wayne. Shooting and Finishing: This 40-min class is held every Wednesday for 10 weeks from 7:20pm-8:00pm at Turf City Indoor Complex in Wayne. This class places focus on the offensive aspect of the game, with special concentration on enhancing the power, finesse, accuracy and quickness of a player’s shot. Specifically targeted towards midfielders and strikers. Tricks and Kicks: This 40-minute class is held every Wednesday for 10 weeks from 6:40pm-7:20pm at Turf City Indoor Complex in Wayne. Technical: emphasizes footwork and ball handling skills to build balance, coordination, and confidence with the ball. Ball mastery, passing, receiving, quick feet, first touch, dribbling, change of direction and speed. Proper touches, accuracy, weight of pass, movement to the ball, juggling, heading and developing of both left and right foot skills. Tactical: focuses on strategic play and increasing the awareness and ability to read the game psychologically, thus leading to a fuller understanding of the player’s position and team role. Ball Mastery: Based on the ISTA curriculum, outlined in part by the Coerver Coaching Method. Influenced by European and South American styles of play, this group training enhances a player’s development no matter what position on the field s/he plays. Moves 101: builds confidence to take on players. Training methods include: attacking and defending, and creating space to make the next play emphasing anticipation, player option and opportunity. 1v1 Small Group Play: emphasizes instructional games that help players create and make better decisions. Activities include: winning 50/50 balls, combination touches and passes, two goal games, reverse goal games, and four goal games. Goalkeeping: these sessions are designed to develop a goalkeeper’s ball handling, diving, timing, communication, angle-coverage, reflexes, reaction time and positional play. ** PLEASE NOTE: All training sessions include small group play to ensure proper implementation of acquired skills. ** ISTA policy prohibits prorating.